2011 Jeep Grand Cherokee Review: For the past few years, the Chrysler Corporation has made a lot of cars that looked great on the outside, but disappointed on the inside. As it entered its later years, the Jeep Grand Cherokee was the same way. It had rugged good looks on the outside, but inside it was putting on pretensions of luxury. It won people over for its off-road ability more than its cabin construction. The big Chrysler 300 sedan is another great example. Its gangsta-styled body was Gorgeous, almost Bentley-like, but its interior was just the opposite. It was roomy, but also cheap and chintzy, which was a big drawback for buyers who cross-shopped with models from Ford and GM. Chrysler has turned a corner. Granted, there's a lot more to the new Grand Cherokee than its snazzy cabin, but that's what you'll notice most of all if you've spent much time in its predecessors. It's classy inside. It feels solid. You want to touch it, love it and treat it carefully, which might seem odd for a rough-and-tumble brand like Jeep, but it also makes you feel like royalty when you sit inside. Soft materials help with the upscale feeling, but you also get the sense that designers were paying a lot more attention to the little things. Switches feel more precise; panel gaps are almost nonexistent; wood trim and strips of chrome make you wonder if you're in something much more expensive, and European. The driving feel, though, isn't as big an improvement. It still feels like a Jeep, with a relatively firm suspension and that heavy, built-from-pig-iron sensation over the road. Acceleration is excellent with the 5.7-liter V8, although it's also available with a more efficient Pentastar V6 that gets up to 23 mpg on the highway. For off-road driving, which is really what the Grand Cherokee is designed to do, there is a new air suspension system that can vary the ride height depending on what you're trying to accomplish. There are five different settings to cover everything from extreme off-road driving (giving you 10.7 inches of ground clearance) to a special low-rider mode that makes it easier to climb in and out of the cabin. Jeep also offers the Selec-Terrain traction control system that uses computers to help you gain footing in different driving conditions. A knob lets you pick from five different conditions, sand / mud, sport, auto, snow and rock, to adjust the powertrain, brakes and suspension for better performance. In fact, all the luxury and off-road tech is reminiscent of a Land Rover, although for a lot less money. It starts just over $30,000. If you select enough options, you get a vehicle that pushes the limits of luxury for the Jeep brand, offering things that you just wouldn't expect a tough, American off-roader to do. My test car, for example, had a power liftgate in back, heated steering wheel, heated and cooled seats, radar cruise control, and a stereo with a hard drive for storing MP3 music files. It's also got a high-class body. One relative, who admittedly isn't a car buff, mistakenly thought it was a Lexus. The styling is sleek, at least by Jeep standards, and provides a wonderfully fresh interpretation of what a Jeep ought to look like. 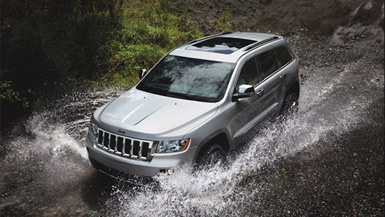 Overall, the new 2011 Grand Cherokee is a sign that Chrysler is getting back on track. It's a major improvement over the old model, especially inside the cabin, but it's also not sacrificing the off-road capability that made Jeep famous. Best of all, it's not just a car that can get you to the middle of nowhere; it's a car that can do so in sublime comfort. What was tested? The 2011 Jeep Grand Cherokee Limited 4x2 model with a base price of $36,320. Options on the test car: Paint upgrade for $225, blind spot warning and adaptive cruise control for $1,295, Luxury Group II for $1,495, V8 engine for $1,495, Media Center Navigation System for $750, and premium wheels for $1,395. The total MSRP price as tested including the $780 destination charge came to $43,455. Why avoid it? That off-road suspension means you'll have to live with a rough ride. It's smooth by Jeep standards but far firmer than crossovers designed for driving around town. Why buy it? The new cabin is amazing. It feels luxurious and classy, but it retains its legendary off-road driving ability.